Nestled at the heart of a great glacial valley, Samoëns has for centuries been the focus of important historical events. Older and larger than neighbouring Morillon, Samoëns retains the friendly charm of an ancient market town, still strongly influenced by its farming and masonry traditions. The Grand Massif skiing is accessed through a base station at Vercland, 2km from the village. The next notable snow forecast for Samoëns is 5cm2in, expected on 20 April, with around 5cm2in forecast over the next 7 days. The French Ski Resort of Samoëns is part of the Grand Massif ski area with access to 265km165 miles of downhill skiing, with 351 marked pistes, served by a total of 78 ski lifts. In addition to the skiing in Samoëns itself (266km165 miles of pisted ski runs), the appropriate ski Lift Pass will allow you to ski or snowboard in the other Grand Massif ski resorts of Flaine, Les Carroz, Morillon and Sixt Fer à Cheval. The ski resort itself is at 1,600m5,249ft, so skiing or boarding back to the resort is usually possible. 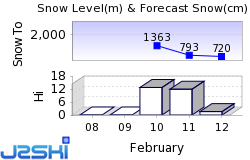 With ski lifts as high as 2,500m8,202ft, snow cover is generally reliable. Nestled at the heart of a great glacial valley, surrounded by seven dramatic peaks, Samoëns has for centuries been the focus of important historical events. Older and larger than neighbouring Morillon, Samoëns retains the friendly charm of an ancient market town, still strongly influenced by its farming and masonry traditions. There's a generally peaceful, timeless feel to the resort, although lively night spots can be found. In recent years the resort has taken a dramatic strep forward with the opening of a modern gondola lift that lifts guests right from the village up in to the Grand Massif, the fifth largest ski area in France and one of the world's 30 biggest. The longest possible descent in Samoëns is 14km9 miles long and the most difficult run is the 'Diamant Noir'. 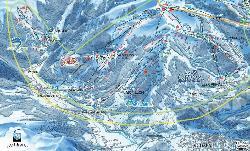 Samoëns is one of five resorts in the grand Massif lift-linked circuit of more than 265 kms (160 miles) of ski runs. It was formerly linked to the circuit a few miles from the village so a ski bus trip was needed to reach the slopes, but now a gondola, the Grand Massif Express, lifts skiers from the village centre up to a key plateau on the circuit, 1600m up, in just eight minutes. Grandes Platières cable car. The 14km (9 miles) long, blue rated wonderful Cascades run descends to the resort of Sixt Fer à Cheval. Expert skiers looking for tough skiing take the same lifts but head for the Combe de Gers sector and a black slope called Styx which is never bashed. This rejoins the long Cascades run at its end. Closer to home the Croix area at Samoëns 1600 has the black slopes Marmotte and Chamois, both really enjoyable runs with jumps and ramps at the end of the slopes. One of the best known areas is the Combe de Gers reached from Samoëns 1600 by heading up to Flaine and then taking the Grandes Platières cable car over to Combe de Gers. Here a black slope called Styx is never crowded. This can take you over to join the Piste des Cascades or take a lift back to Flaine. Heliskiing (into Italy, not legal in France) is possible through the ski school, minimum of three participants of at least level three ability equivalent on the French scale. The Ski school also organises excursions to the legendary Vallee Blanche above Chamonix where descents of up to 25km (17 miles) off piste are possible from 3842 metres. There are three parks in the Grand Massif region. Above Morillon the park is especially for children, above Samoëns on the Soleil slope there's a park for all levels of ability, whilst -Flaine's The Jam Park in the Vernant area contains a Boarder Cross and other features. The snow park's construction depends on snow conditions and its location is changed accordingly on occasion. It is aimed at experienced freeskiers and boarders. We don't currently have confirmed season dates for Samoëns. Usual opening is late December, and usual closing is Late April. NOTE:- Lift and Piste openings are always subject to Snow Conditions in Samoëns. Samoëns is able to make snow, on 35km22 miles of ski runs, with 143 snow cannons. The 16 ski lifts of Samoëns are able to uplift 16,700 skiers and snowboarders every hour. Samoëns is in the French Alps in Grand Massif, Haute-Savoie, France. The nearest airports to Samoëns are Geneva, Annecy and Chambery. There are 10 airports within three hours drive. Annecy and Geneva are just one hours drive away, in good driving conditions, so you can be on the piste quickly. The Webcams in Samoëns are not always up-to-date. Please check the date on the image to ensure you are seeing current snow conditions. Not a great après ski destination if you're lucking for all night party action, but a good choice for good wholesome evening entertainments. The Clarine Bar is very modern and has created an original selection of entertaining cocktails as well as a big choice of beers. Le Savoie is another good bar with internet access and sometimes live bands during the ski season. Another bar, Le Covey's, has Irish owners, a wide range of beers and a reputation for good craik. Another good choice is L'Aspen which is wood lined with attractive carvings and decorations. Here there are different beers from all around the world as well as the local Samoëns brew, Criou, named after the local mountain. Other Ski Areas within Grand Massif. Other popular Ski Areas near Samoëns. Want to ask about skiing and snowboarding in Samoëns? Or contact Samoëns Tourist Office. Note :- The information on J2Ski concerning Samoëns, where not clearly factual, is opinion only and is neither definitive or exhaustive.